Dr Abdul Rahman (right) giving suggestions to improve the school’s reading corner. MIRI: SM Sains Miri and two schools in Miri are high performing cluster schools that could become role models for other schools in the nation and beyond. The other two schools are Kolej Tun Datu Tuanku Hj Bujang and SK Agama (MIS) Miri. Cluster of excellence advisory panel chairman Tan Sri Dr Abdul Rahman Arshad said all three schools showed great commitment to improve all aspects of development for their students. “I dare say SM Sains is one of the best schools and could be a model school. The teachers are eager to do better and there is awareness by the senior assistant to achieve at state and national levels. In some areas, they achieved international level. 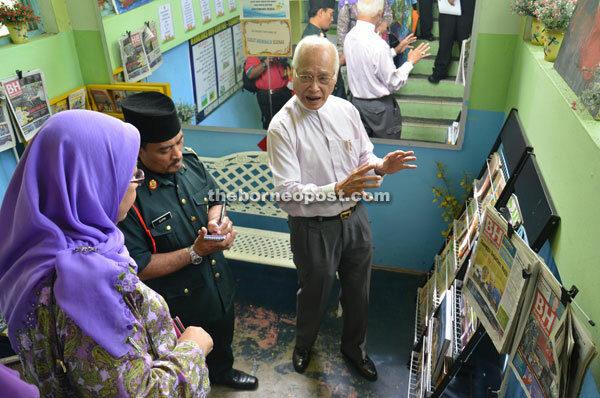 “I can say that as I can see their performance from subject to subject,” Dr Abdul Rahman told The Borneo Post yesterday after visiting SK Agama Miri. Among those present were senior officials from the Ministry of Education, District Education Officer Rosnani Yunus, Senior Assistant 1 of SK Agama. Sapri Paee and chairman of the school’s Parent-Teacher Association, Abdul Wahab Aman. SK Agama Miri could be a model primary school for the country. It focuses on holistic education development, religion (Islam) and subjects like English and Arabic. Dr Abdul Rahman said in the past most graduates of Islamic schools or institutions in Malaysia were only proficient in Islam and Arabic language and, without mastering English, were unable to compete in the international arena. A fast developing nation like Malaysia needs a more multi-skilled workforce including knowledge of religions. Dr Abdul Rahman has visited over 100 such schools in the country to give advice on how to improve their standard.